The Liliales order includes many homeopathically relevant remedies such as Colchicum, Lilium tigrinum, Sarsaparilla, and Veratrum album. Although they belong to different plant families, they have striking similarities, including the vital sensation identified by Sankaran. Like Michal Yakir, the Indian homeopath is guided by the Cronquist system, which – in contrast to the APG classification – also counts Irises, Hyacinths, Agaves, and Asparagus as part of this large group. The themes of all these plant remedies are about belonging to a group, social position, recognition as well as attractiveness and sexuality. Corresponding to the cultural imagery associated with the lily, we find the issues of love and purity, religion and morality, together with shame and suppressed feelings. Therefore the physical focus is the heart and the hormonal system. Jan Scholten further differentiates the themes of the Liliales according to the different families, which to some extent also belong to another order. 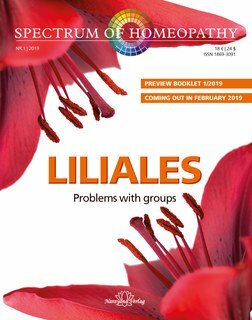 This issue of SPECTRUM therefore offers the opportunity to compare and contrast the plant systems of Scholten, Sankaran, and Yakir via their differing understanding of the Liliales.